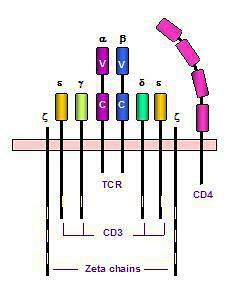 It is not clear whether CD3 contacts CD4 or CD8 directly, nor have the regulation and interregulation of expression of these three receptor molecules been determined. We explored these issues by first stimulating human peripheral blood lymphocytes in vitro with three well-characterized T-cell receptor-directed mitogens (phytohemagglutinin [PHA], concanavalin A [ConA], and anti-CD3 monoclonal antibody [anti-CD3]) and then using multiparameter flow cytometric techniques to investigate modulation of surface (sur) and cytoplasmic (c) CD3, CD4, and CD8. Cultures with alphaCD3 had a rapid, large, and persistent decline in surCD3; the cCD3 median fluorescent intensity (MFI) declined gradually, over the entire culture period. With anti-CD3, surCD4 MFI and cCD4 MFI declined by days 4 to 8 (31% of ex vivo value, p < 0.001 and 47%, p = 0.033), as did surCD8 MFI (58%, p = 0.010). PHA was associated with an increase in surCD8%, surCD8 MFI, and cCD8% at days 4 to 8 (178% of ex vivo, p = 0.003; 168%, p = 0.025; and 331%, p = 0.001). For PHA at days 4 to 8, cCD8 MFI was highly variable but always higher than in unstimulated cultures (5 of 5 experiments). With ConA, at 3 to 5 hours ex vivo, there was a decrease in surCD3 MFI relative to ex vivo (64%), surCD4% (83%), cCD4% (87%), surCD4 MFI (50%) and cCD4 MFI (48%), surCD8% (85%) and an increase in cCD8% (260%). As with PHA, at days 4 to 8, surCD8% was high relative to ex vivo (169%). Thus, we found that anti-CD3 had delayed effects on CD4 and CD8; PHA had delayed effects on CD8 only; and ConA had very rapid effects on CD3, CD4, and CD8, as well as a delayed effect on surface CD8. These effects involve both surface and cytoplasmic antigen expression and are more consistent with degradation or retention, rather than with shedding or increased production. They may reflect direct interactions between CD4 or CD8 and CD3 and/or interregulation of CD3 expression with expression of these coreceptor molecules.